Good evening good evening good evening. Tonight’s dinner could be described as a little extravagant for a weeknight meal, but sod it – I’m celebrating. Today marked my last ever shift at Morrisons and consequently the last time I will ever be required to preside over the self-scan checkouts, which easily has to be the most hateful job in the universe. Thus I decided that I had a very good reason to cook something unusual, slightly labour-intensive and a little bit cheffy. 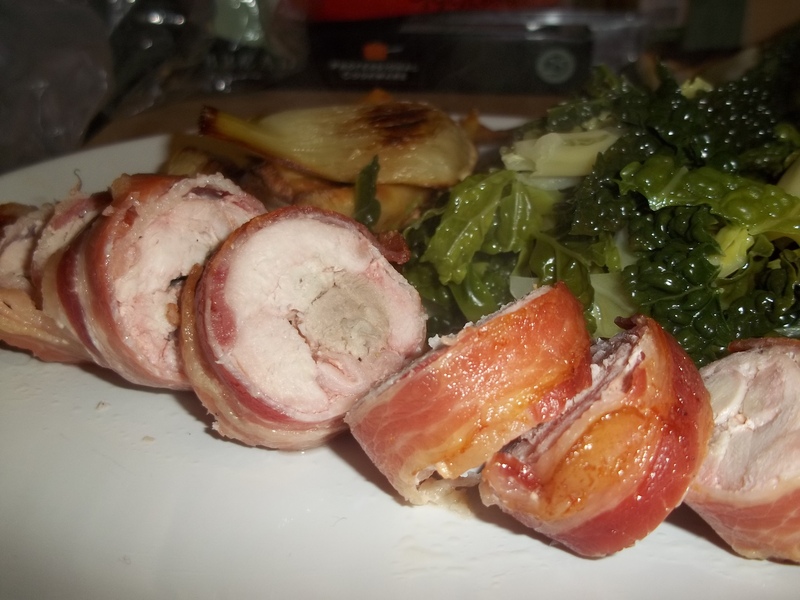 I was really pleased with how this turned out, and although it tipped the scales slightly in favour of being restaurant food (as far as my cooking ever does) it was really good value to make. If you can get your butcher to bone your rabbit for you, I highly recommend it as I made something of a hash of it. Also, this would work equally well with chicken. You can read about my reasons for eating rabbit here. I realise this isn’t technically a ballotine, as I didn’t stuff it with anything. However, I decided that it was a better name than “Bunny in Bacon” which was the alternative. Marinade the rabbit in buttermilk seasoned with salt and pepper. Do this overnight if possible, or for a couple of hours if not. Grease some squares of tin foil (one per ballotine). I used some of the fat I rendered from using A Man’s dad’s bacon to cook carbonara the other day. Lay the bacon rashers, slightly overlapping one another, on the greased foil. Stretch the bacon slightly with your fingers to thin it out, but be careful not to break it. Lay the rabbit pieces on top of the bacon. If you are anything like me, and end up with lots of little pieces of rabbit rather than simply boned joints, that’s OK because the bacon will keep everything together. 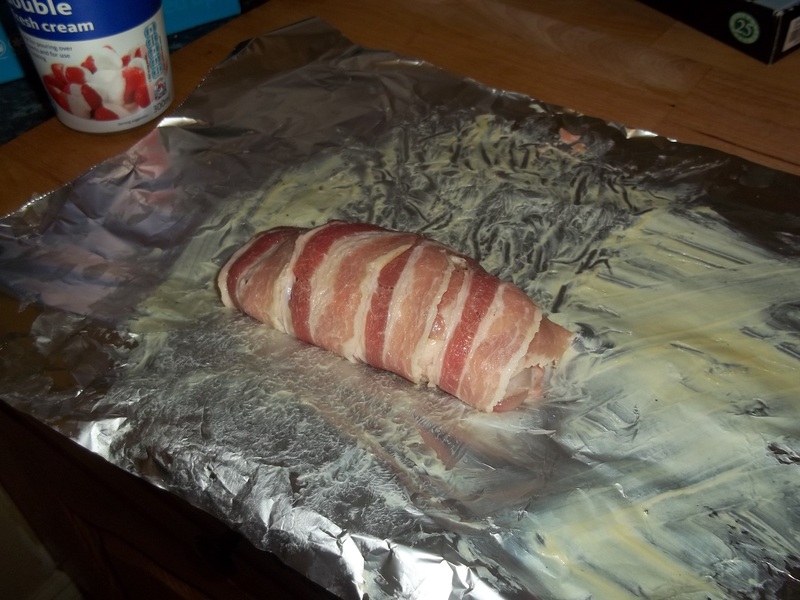 Wrap the bacon around the rabbit, and wrap the foil tightly around the bacon, securing the ends. Bring a pan of water to the boil and turn down to a simmer. Cook the parcels for 10 minutes. Meanwhile, quarter the fennel and parsnips (Peeling if necessary) and shred the cabbage. Add the fennel and parsnips to the water for 10 minutes. Place a baking sheet in the oven and preheat as high as it will go. Remove the veg from the water, place on the hot tray and put it back in the oven to bake. Unwrap the rabbit and keep warm on a plate. Turn the oven down to a medium-hot temperature. After the veg has been cooking for around 10 minutes, add the rabbit to the baking tray. Cook the cabbage and serve everything once the bacon is crispy and the fennel and parsnips have started to brown.